With details concerning major attractions, off-the-beaten-track spots, drinking and nightlife venues, and restaurants and hotels/hostels from every province (as well as Hong Kong, Macau and Taiwan), Apart from all the money readers can save by following the Panda with this book, this edition of China comes with four separate pullout maps (for China and the cities of Beijing, Shanghai and Hong Kong). Each province also has a provincial map, as well as individual maps for cities, key tourist attractions, mountains, national parks and villages to ensure you never get lost. What’s more, we’ve made the travel experience even easier by placing each attraction’s vital info (i.e. transportation details, opening hours, admission, phone number, website, etc.) in clearly marked orange boxes at the beginning of every listing. SKU: 9780992026837. Category: Travel. Tags: China, Mandarin, Panda Guides, travel. With details concerning major attractions, off-the-beaten-track spots, drinking and nightlife venues, and restaurants and hotels/hostels from every province (as well as Hong Kong, Macau and Taiwan). Apart from all the money readers can save by following the Panda with this book, this edition of China comes with four separate pullout maps (for China and the cities of Beijing, Shanghai and Hong Kong). Each province also has a provincial map, as well as individual maps for cities, key tourist attractions, mountains, national parks and villages to ensure you never get lost. What’s more, we’ve made the travel experience even easier by placing each attraction’s vital info (i.e. transportation details, opening hours, admission, phone number, website, etc.) in clearly marked orange boxes at the beginning of every listing. This volume is also packed with sample itineraries, a Mandarin phrasebook, a user-friendly index, sections on culture, history, art, music, kung fu, and movies, full-color pictures (to give you an engrossing feel of a destination before you even go) and much more! Plus, the Hot Topics section will reveal what life on the ground is like with coverage of fascinating themes such as Air Pollution, Food & Water Safety, Traveling with Kids, Scams, Travel, Culture Shock, Taboo & Etiquette and others. For all this and more, Panda Guides China isn’t just a guide, it’s an experience. For more on our books and maps, and to get updated information concerning travel news and special events throughout China, check out www.PandaGuides.com. Robert Linnet Born in Denver, CO, Robert received his BA in Linguistics from the nearby University of Colorado. After growing up admiring ancient Taoist philosophies and the furious fists of Bruce Lee and Gordon Liu, he came to China in 2009 for a summer stint at a martial arts school and a month of travel. Utterly smitten with the country, he hurried back in the summer of 2010 and has made it his home ever since. Robert has traveled to more than 20 cities throughout China, practices kettlebell and Baji Chuan kung fu, and is obsessed with adding to the thousands of Chinese characters he currently reads and writes. Though he resides in Beijing, he recently made a trip to his girlfriend Chen Chen’s hometown of Xi’an to marry her. Robert speaks fluent Mandarin and French and is working on adding Shaanxi Hua (the dialect of Xi’an) to the list. Trey Archer Trey Archer is from Lake Charles, Louisiana and studied International Affairs at the George Washington University. While backpacking Latin America in 2007, he declared while hitchhiking by boat from Colombia to Panama that he’d pursue a career in travel writing after graduation instead of entering the world of diplomacy. Since then he has traveled to nearly 100 countries, speaks Spanish, Portuguese and Mandarin fluently, and has lived in nine different nations. In his free time he practices various martial arts (especially muay Thai), keeps up with the New Orleans Saints, cycles and is still obsessed with traveling. He’s been in China for six years and has visited almost every province, but currently he resides in the hutongs of Beijing. Grant Dou Grant was born in Jiangsu Province and spent the first 30 years of his life in China. After receiving a PhD in Hydraulic Structural Engineering and teaching as a college professor, he moved to Toronto in 2002 to become a successful writer and publisher. Since then he has lived and traveled throughout North America, China and other Asian cities, so much that he often thinks with a Western mind and sees through local eyes. Grant recently moved back to China and currently resides in Beijing with his lovely wife; though he still experiences bits of reverse culture shock every once in a while. With details concerning major attractions, off-the-beaten-track spots, drinking and nightlife venues, and restaurants and hotels/hostels from all over the city, Panda Guides Shanghai is the most complete guide of its kind. Written by a team of expats who live in and know China’s roaring financial capital, our Shanghai title is the first guidebook of its kind to offer local discounts to readers, as well as an opportunity to win a free trip through China by purchasing the book. Swept Away by WANDERLUST is a coffee table style journal that inspires you to dream and capture all your travel adventures. Full of inspiration, beautiful photography and travel motivation that ignites the wanderlust spirit, it is the perfect gift for every traveler, adventurer & life seeker. Swept Away by WANDERLUST is a creatively designed book with fun, quirky writing prompts that spark you to capture your special moments before they are forgotten. The Panda Guides China Travel Map is more than just a map. 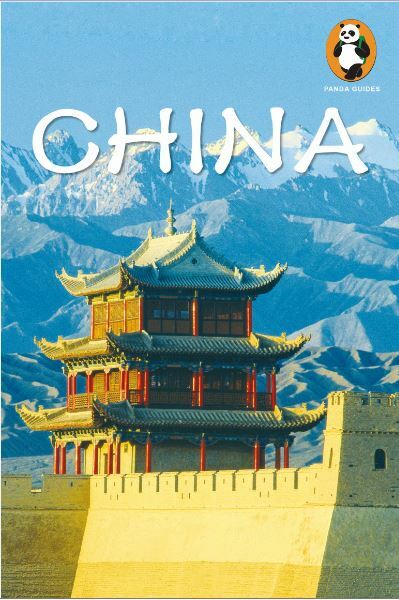 The China Travel Map, which the publisher affectionately refers to as The Great Map of China, is a handy tool for the long term traveler seeking to explore various cities in multiple provinces. Depicted is the entire region of greater China with every province (including Hong Kong, Macau and Taiwan) in color, along with neighboring countries. Major transportation routes, such as railway and highway routes, are clearly marked, and travelers will also be able to easily locate major cities, tourist attractions, and off-the-beaten track villages with ease. On the back, you will come across information for the top 15 attractions in all of China (like Shaolin Temple, the Great Wall and Terracotta Warriors, to name a few). In Panda Guides Hong Kong we’ve made the travel experience even easier by placing each attraction’s vital info (i.e. transportation details, opening hours, admission, phone number, website, etc.) in clearly marked orange boxes at the beginning of every listing. This volume is also packed with sample itineraries, a Cantonese phrasebook, a user-friendly index, sections on culture, history, art, music, and movies, full-color pictures (to give you an engrossing feel of a destination before the reader even goes) and much more!